The island mountain summit with it's nose up. Starting points: 2 different starting points. Route 1 and 2 follow the same trail up the mountain, they only differ the 3 starting kms. These routes are at the west-side of the island, while the Teigstad route is now closed because of landslides. Experience in hiking in steep terrain is an advantage. To get to Breivika drive to Bjørn (where the ferry from Sandnessjøen stops), and then drive towards Solfjellsjøen at the northern part of Dønna. Just before reaching Solfjellsjøen, turn left at the signpost to "Breivika". Drive to the end of the road. Breivika is also a marvellous beach. Download description of the hike. 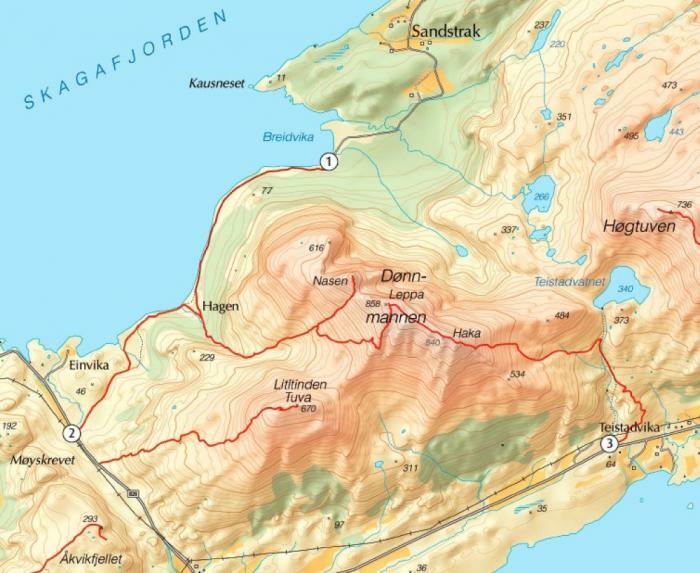 If you come from Herøy, Einvika is loacted a few Kms after the Åkviksundet bridge (connecting Herøy and Dønna). From Bjørn at Dønna it is about 15 kms to Einvika - past the Teigstad starting point. The Teigstad route faces Sandnessjøen. 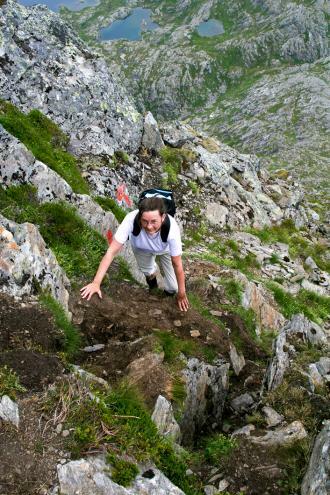 Experience in hiking in steep terrain is an advantage.